Today marks the day when you can pre-order my debut novel, STAR-CROSSED: THE CONFOUNDING CALAMITIES OF BYRON THE CAD AND MARIETTA THE ZOMBIE from Amazon! It releases on Halloween, as I said in my last post and I would be so wonderfully grateful if you’d drop a line and review it! So…now that this one is done….WHAT DO? 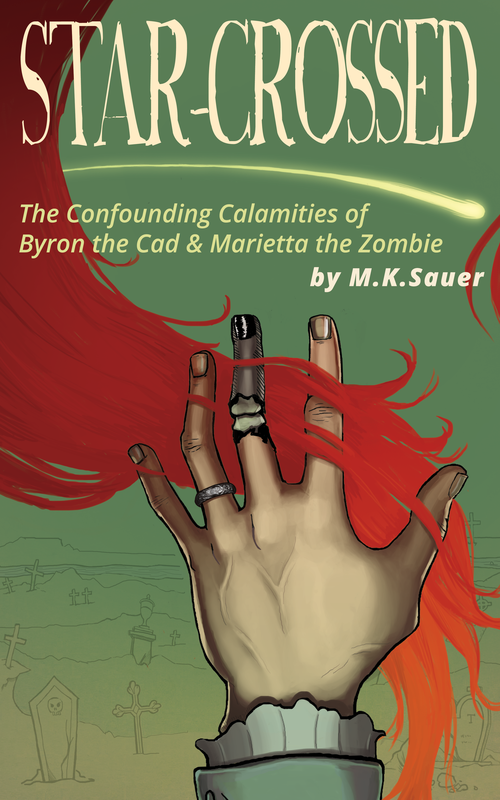 I have decided upon a Halloween release date for my self-published novel STAR-CROSSED: THE CONFOUNDING CALAMITIES OF BYRON THE CAD AND MARIETTA THE ZOMBIE. I mean, Halloween = Zombies and Zombies = Witty Dialogue and Witty Dialogue = MY NOVEL, so it all checks out. I’m going to start out on the Amazon Kindle and then move to everywhere else in the market. Print books will come soon, too. Below is a little re-vamped (ha! see what I really didn’t do there but totally could if I wanted?) cover for the Kindle version! It’s slightly greener, and as we all know, GREEN = ZOMBIES (and maybe the Hulk), so that checks out, too. I’m really only expecting to sell about fifty copies (and those all coming from my friends, family, and those I have threatened with bodily harm) but anything could happen. I’ve had to really re-assess what it means to me to be a writer and what I want from my life as a novelist. Is it more important to be seen (i.e. get published no matter what) or is it more important to find an agent and go the traditional route and continue to shop a somewhat unmarketable novel around until, years later, it may or may not ever be published? Which pretty much sums up all of the criticism I’ve received about my short stories too, so I’m now of the understanding that STAR-CROSSED is just too weird, too niche, and too genre-bending to find an agent or a house any time within the next decade. HALLOWEEN. YOU. ME. A STEAMPUNK ZOMBIE NOVEL. I think the best part is going to be talking to my mom after she (unsuccessfully) tries to read my novel. You Know How Tags Work, Right Emkay?